Thanks to www.rodenplant.com for the historical background. By now most of us have realized that Roden is here to stay. They have found a place in the modeling community and a method of producing and choosing subjects that have not only enthusiast interest, but a lot of staying power. 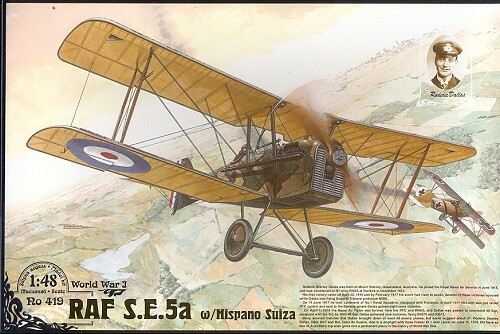 This latest SE.5a kit is a great example of that. 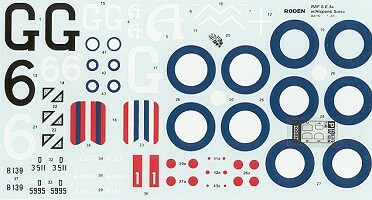 When Roden designs a kit, they generally do but a single set of sprues. 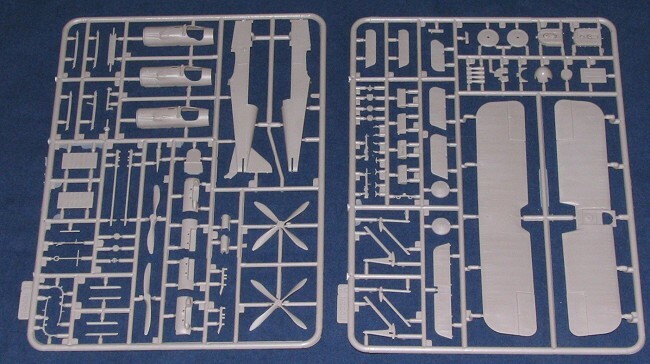 Then they either include the bits for all variants in the box or (as they did in the past) provide those additional parts needed to a base set of sprues. You'll find three different cockpit sections, four different props, two different engine covers, two different radiators, as well as optional bits such as a head rest and bombs. Many of these bits are completely dependent on which aircraft is being modeled as WWI aircraft were not as uniformly produced as one would find nowadays. A dozen different makers of a design would often find differences in details and even in engines used. This is all detailed in the instructions. They are very well done with clear construction sequences that differentiate between the optional bits when time comes to attach them. The instructions also provide color references in Humbrol and generic names. A well-drawn rigging diagram is provided, a necessary addition as the SE.5a had quite a bit of it. Markings are provided for six aircraft, five of them in Matte WWI Green over linen. These planes are from 56 Sq (two options), 143 Sq, 60 Sq, and 111 Sq. These planes have geometric patterns on the rear fuselage and the 143 Sq had night insignia. The real interesting camo (as was seen on the Sopwith Salamander) is the 40 Sq option. This is a disruptive scheme of Matte Light Earth and Matte Chocolate over the standard Green shade. The decal sheet is large and very well printed. Judging from the sheet I used with the 1/32 Dr.I, this sheet should work just great, but the white may be a bit transparent so some backing is suggested for the disruptive camo scheme. This is another really fine Roden WWI kit. Roden is fast becoming a major player in the production of WWI models for the enthusiast. One can only hope that not only will this continue, but that we'll be seeing some of these enlarged to 1/32 scale.